My roses have started coming out. In fact, my rose garden is looking really rather nice. I ended up doing a whole pile of weeding though, as a few of the rose bushes seemed to be getting swamped by all the lemon balm and mint. A few of the rose leaves seem to have holes cut out of them – given that I have sage in the rose garden, I will be surprised if this is down to slugs (particularly as they just eat the whole plant, as far as I can see). My husband’s mum said that there are a few wasps that cut holes out of leaves so perhaps that is it. The thing about weeding is it takes all morning or all day or as much time as you have before you absolutely HAVE to stop and attend to something else. Whenever you think you’re finished, you stand back to admire and then – damn! – see another spot that needs tending. It didn’t help that I’d put in a load of love in a mist so had to make sure that I didn’t stand on any of the plants while I was weeding. Next > Where have all the bees gone? That would be a Leaf cutter bee, (Megachile centuncularis) not a wasp… But those leaves in the pic were not cut by a bee. 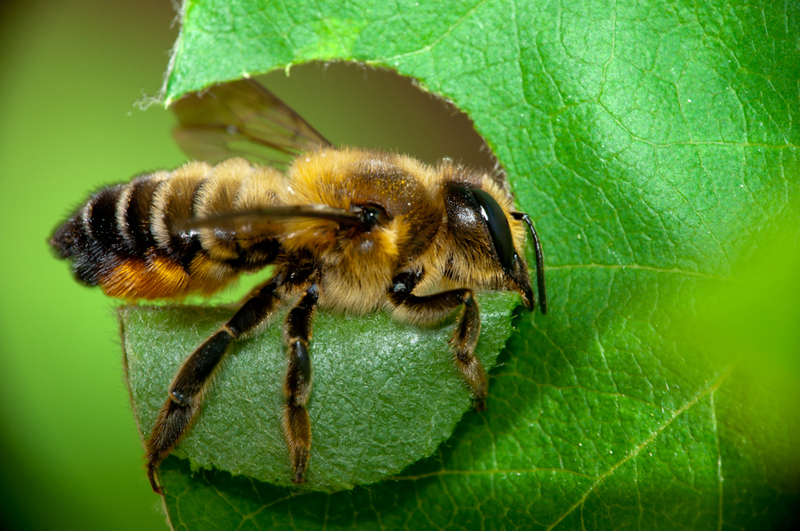 Bees cut clean, circular shapes rather than just munch holes. It could be saw fly larvae?